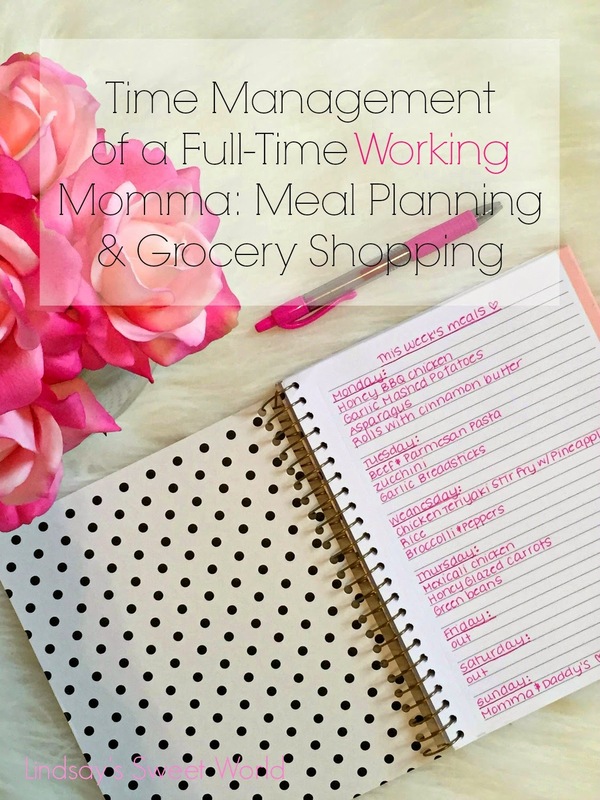 I have decided to break up the time management portion of my “Full-Time Working Momma” series into a few different posts. As you all know by now, I can get a little wordy, and if I didn’t break this up, I’d lose you about halfway through… probably sooner. Wait, are you even here to begin with?! 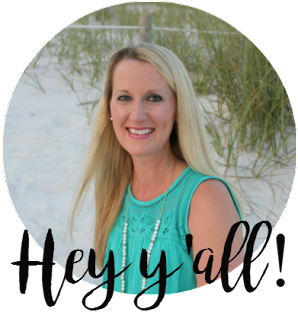 In my last blog post I discussed our typical weekday schedule, ya know, what we actually do on a daily basis. 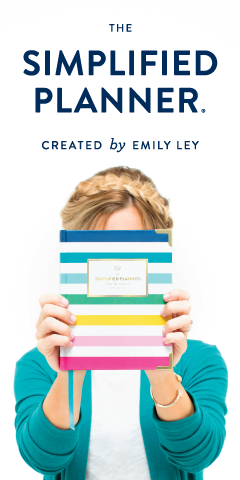 Throughout this next series about time management, I will incorporate all of the extras – grocery shopping, meal planning, laundry, cleaning, etc. – when do I have time for all of this?! The answer is that I barely do, so I try to do certain things as seldom as possible. For instance, grocery shopping. I only grocery shop every two weeks because, grocery shopping every week? #Ain’tNobodyGotTimeFoDat. Every other Monday is grocery shopping day, and I do it on my lunch hour at work. I'm fortunate enough to work close to home and have a Publix just four minutes from our house (four minutes exactly, trust me, I’ve timed it) so I’m able to get to Publix, get home to put everything up, and get back to work in just one hour. It’s glorious! And not having to grocery shop on the weekend = more time with the babies! I have an app on my phone called List Master and it is, by far, the greatest thing since sliced bread. I love it so much that one day I might even dedicate an entire blog post just to show you how I utilize its zillions of functions. 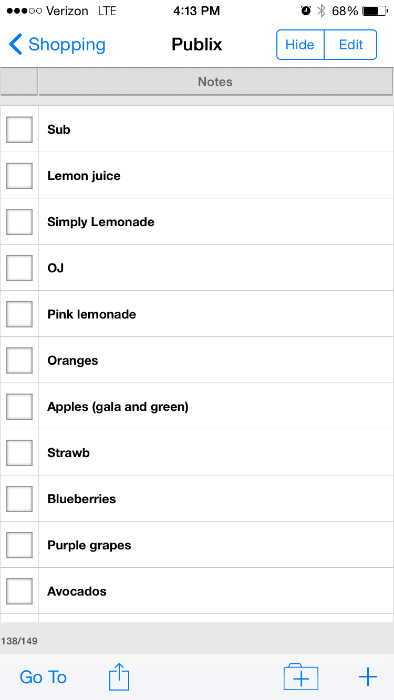 Anyhoo, I created a list in my List Master app of every single thing that I buy from Publix, and they are listed in the order in which the items are displayed at Publix, aisle by aisle. code each line to have a different color for each aisle. I will probably do that one day when I have the time! Each item has a little check box to the left of it, and I leave all of the items checked off until I make my list. Then the Sunday afternoon before shopping day, I go through our fridge and pantry and uncheck the items on the list that we need. I also take five minutes to plan dinner for the next two weeks (usually 6-8 meals), and uncheck the items that I will need to make the meals. Anything that we don’t need remains checked off so I know not to buy it. As far as meal planning goes, I have recipe cards for each meal that I make (around 20 different ones that are in the regular rotation) and they each have the ingredients listed right on them. That way, I have everything right at my fingertips to make my grocery list. Monday on my lunch break I drive to Publix and zoom through the aisles. Having the grocery list in aisle by aisle order enables me to be in and out of there in about 15-20 minutes depending on how long I have to wait to check out. It also means that no unnecessary items get thrown into the cart (can’t say the same for when hubs goes to the grocery store) and I never have to waste time hunting for anything. And why Mondays, you ask? I have found that Mondays during my lunch break (I go from 11-12 to avoid the 12-1 traffic) is when my Publix is the slowest. There aren’t many people in there at that time, so I don’t have to fight to get down the aisles, and I barely ever have to wait to check out. AND since I loathe grocery shopping so much (not sure why, but I hate it), I always reward myself with a Publix sub to eat at my desk when I get back to work (#TreatYoself). Their website allows you to preorder online, so it’s just waiting in the refrigerator for you when you get there! If you’ve never had a Publix sub, RUN - don't walk - and get one right this very instant. Once you have one, you will never eat a Subway again! And for those of you who don't have a Publix near you, my condolences. Try to keep your number of trips to the grocery store to a minimum. Try to shop during a time when the store is not as busy. 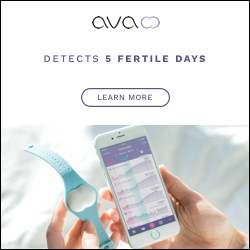 Find a list-making app that works for you. 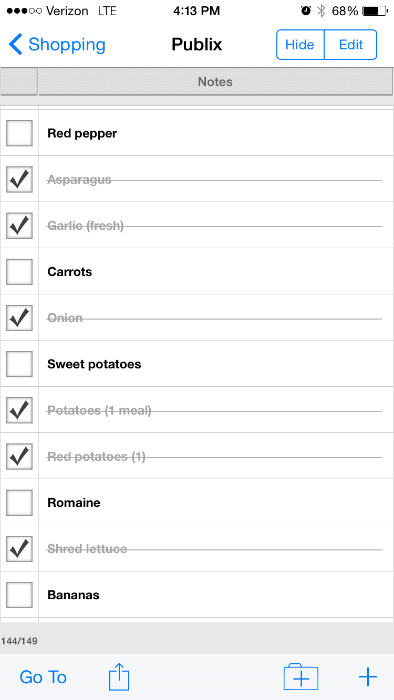 Organize your grocery list by the order in which you walk the aisles of your store. I do have to make the occasional trip to the grocery store on my “off” week for milk or fruit or other perishable items, but that doesn’t happen too often, and when it does, I’m in and out in five minutes. I hope you all enjoyed my tips for quick meal planning and grocery shopping. Every minute saved is an extra minute with your munchkins! You're so welcome!! I will most definitely do a tutorial on my Listmaster App... it is the absolute BEST EVER!! Please share your recipies! I would love to add your one pot meals and Crete a rotation this summer. Such fabulous ideas!